We are no longer accepting contributions for woven translations, however we would still like to hear from you! We invite you to follow the Material Turn Project for future news. 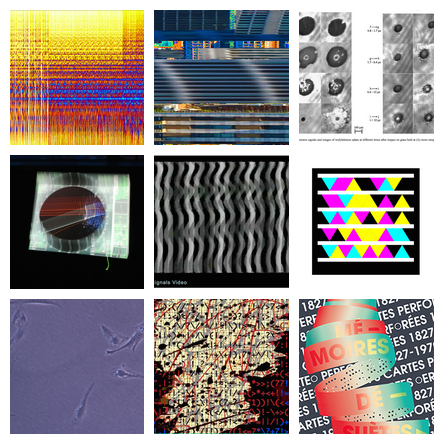 We welcome your contributions to the Material Codes: Ephemeral Traces project. Submit an image of your interpretation of digital data to the project! Submitted images, if selected, will be translated into Jacquard weavings. Through image contributions we receive, we hope to expand our collective understanding of digital data and what it could look like as an aesthetic form. The Material Codes: Ephemeral Traces project is interested in materializing digital data through computerized weaving. In particular, we are focused on the aesthetics of malfunction and the material impacts of the technologies we rely on daily and that affect society and culture. We are interested in questions of how information is controlled, used and shared within society and exploring ideas of trustworthiness, fallibility and ephemeral residues through the medium of woven textiles. The Material Codes: Ephemeral Traces project, now in its second year, has involved research assistants, visual artists, musicians and professionals in other fields such as mechanical engineering, IT, and journalism as contributors to the data materialization testing. Our current goal is to expand this field to include wider sources of research data, for visualization purposes. Researchers working on environmental, water, urban, communication or corporate themes are particularly sought as data contributors. how can we make visible the invisible? what are we confronted with when data goes wrong? When do we notice our ubiquitous technology? how does data communicate our current cultural, environmental or economic practices? Please include a short description of your image and its relationship to digital data. What is the most important aspect of that relationship to you? This will help us to highlight that particular concept. We will weave two copies of your image: one for you (you will receive your own handwoven textile of the interpreted image), and one for our project documentation. There are no guarantees that all contributions will be able to be woven within the parameters of this project, but we will contact you further once we receive your submission. Thank you for contributing to our research! What is this? Why is this making you aware of data? What is the most important aspect of the file? Please take the time to consult the INFORMATION AND CONSENT TO PARTICIPATE IN A RESEARCH STUDY before submitting your file. I accept that my name and the information I provide appear in publications of the results of the research. Please do not publish my name as part of the results of the research.